After splitting the opening four games of the 2018 season, the No. 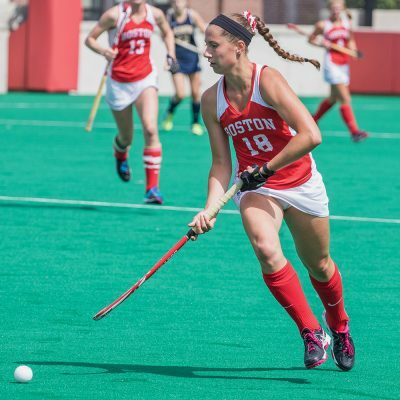 19 Boston University field hockey team will be looking to force a winning record during a road trip to to Illinois, where the Terriers (2-2) faces off against Miami University and No. 12 Northwestern University. The three teams will be meeting at Northwestern’s (3-2) home Lakeside Field in Evanston, Illinois. The Wildcats will get the first face-off against Miami (3-2) first on Sept. 7. The Terriers then has its turn against the RedHawks at noon Saturday. Twenty-five hours later, Northwestern will take Miami’s place. BU head coach Sally Starr spoke to focusing on what was directly ahead on the schedule. Miami was voted as the top contender in the Mid-American Conference in a preseason poll among coaches. During the 2017 season, the RedHawks won the title of regular-season and tournament champions before being eliminated from the first round of the NCAA tournament by Duke University. Miami started this season with a shutout win and loss at home. The RedHawks then took off for a California road trip, where they earned a 2-1 record. The RedHawks have two shutouts so far in the season. In both games, Miami goalkeeper Maddie Passarella made a combined total of three saves. Starr stated that the Terriers’ needed to be stronger in their defense play. “I think just defensive organization in our defensive third of the field [is something to focus on],” Starr said. In the 2017 season, Passarella was named to the All-MAC First team and MAC All-Tournament team after starting in all 21 games and earning a goals-against average of 1.74. Senior Avery Sturm was also named to the MAC All-Tournament team and put up three points during the RedHawk’s conference championship series. Miami is led offensively by senior Paula Portugal, who scored a hat trick in the RedHawk’s first game of the season and whose nine points and 37 shots lead the team. Last year, Portugal put up a personal-best 52 points on 20 goals and 12 assists while averaging 0.95 goals per game. The Terriers have also had plentiful scoring opportunities, but need to do more with them, according to Starr. Northwestern is also coming off a strong 2017 season, during which it made its deepest NCAA tournament push in 23 years and maintained a perfect record on the Wildcats’ home field. Four of the team’s top five scorers have returned for the 2018 season, including senior Puck Pentenga. Last season, Pentenga led the team in assists with 17 and points with 39. So far, in 2018, Pentenga has 12 points. In goal, BU will face another brick wall in the form of Northwestern redshirt junior Annie Kalfas. Kalfas started in all 22 games last season for the Wildcats while allowing for 1.80 goals against average. She also tied for fourth in the league with three individual shutouts. So far this season, Kalfas has been splitting the goal with sophomore goalkeeper Florien Marcussen. Through her eight-game career at Northwestern, Marcussen has earned a .618 save percentage. However, the Wildcats have yet to settle into their play. After breaking its home winning streak on opening night, Northwestern only put together its first back-to-back wins of the season Sept. 4 against Kent State University. BU opened its season by sweeping the Wildcat Classic against Northeastern University and the University of New Hampshire, allowing only one goal while putting up eight points throughout the course of the tournament. The Terriers then dropped two games against the No. 25 University of Maine and the No. 24 Ohio State University on their first home stand of the season on New Balance Field. Olivia O’Brien contributed to the reporting of this article.